First presented for "Philadelphia Preservation Week ‘94"
The EL ride is filled with treasures. Here are a few of them. The Frankford EL is six miles long. It was dedicated on November 4, 1922 and opened the next day. The EL is very fast, and may require a few rides to see everything. You can cross over at most stations. These views are from the front car, sitting on the right side. From front of the train: You can see both sides of a long distance view of what’s ahead. Right side of car: You can see down on the sidewalk, but things come up very fast. Left side of car: There is a nice broad view, but passing trains are a distraction. Straight down: Great view of store fronts and sidewalk activity. Straight out: Dancing cornices and broad vistas await you. Over the roof tops: Great vistas of diversity. Excellent at sunset. Thanks to my technical assistant, Bob Weise! Second Street Eastbound from Second Street. As you come up from underground, you will see the Benjamin Franklin Bridge (1926) and the waterfront. Spring Garden Built during the EL relocation for I-95. It replaced Fairmount Station. When pulling away from I-95, look down: The Buckingham Valley Trolley Association storage facility. Girard Under Construction. When leaving station: "Ghost Sign" – "Bo Theater Good Show" on side of building (Fox Electric). Berks Look forward and up: Milk bottle water tower on Harbison Dairy’s Building. York – Dauphin Look back when leaving station to see stairwell building details. Get off for best view. (Each station is different.) After large open lot: Kelly’s Korner (2501 Kensington Avenue) was the trolley shop of the Philadelphia Rapid Transit Co. Beautiful steel trusses and skylights inside are worth a visit. Huntingdon At Station: Greek Revival Bank (1909), get off to see the beautiful sculpture in the pediment. Bridge over Lehigh Avenue is a steel arch spanning 112’, followed by double truss bridges (196’ and 143’) over abandoned Reading Railroad tracks. Somerset Halfway between stations: "Salvation Army" building is a fine example of glazed-header brickwork. 3129 Kensington Avenue. Tioga Twin Pratt Truss bridge over Amtrak lines. 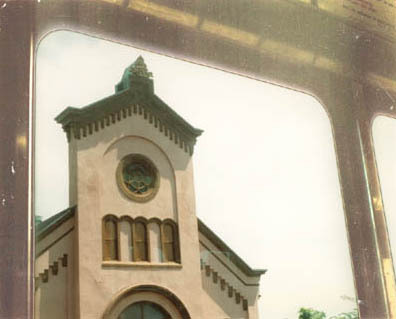 Off in the distance: Moorish-style steeple with clock. Sterling Paper Co. 2000 Castor Avenue. Church Street Beautiful church (Presbyterian Church of Frankford). 4301 Frankford Avenue. Two historic markers are on the front lawn: One for "The King’s Highway" 1675 and one for George Washington, "The General’s Highway" December 3- 23, 1783, on his triumphant journey to Yorktown. Margaret – Orthodox Halfway between stops: Hermon Presbyterian Church and small park. 4800 Frankford Avenue. Bridge Street End of the line. This terminal became the gateway to downtown Philadelphia. Bridge Street Off in the distance: Frankford High School (1914) 4900 Oxford Avenue. Tall fort-like towers can be seen from many locations. Church Street After Frankford Creek, look down: "Bricklayer’s Union #1" in fancy brickwork. York – Dauphin Stucco building with fancy column caps and medical symbols. Get off for best view. Berks After large used car lot: Old triangle fire house with lookout tower. 1625 North Howard Street. Girard When leaving station: Daniel Boone Public School. 1100 North Hancock Street. Spring Garden Billy Penn and our new skyline. Second Street End of tour.